The SSAE16 standard is a recent evolvement of SAS70, which intends to align US companies with ISAE 3402 the international standard. This process is designed to help in guaranteeing a higher level of security and reliability in hosting the type of sensitive eCommerce operations for the clients. All facility entrances/exits card key controlled. Our power system was designed for maximum efficiency and redundancy while still able to deliver as much as 80 amps per cabinet during peak load. 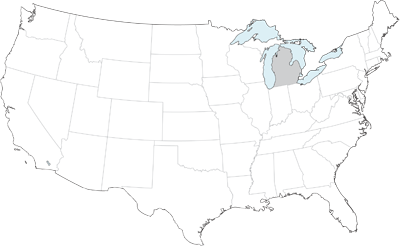 Our facility is fed with a 600 amp 480V 3-phase connection to DTE (Detroit Edison). We use Liebert Interceptor series surge suppression at the main breaker to bleed off any surge in power before it reaches any internal systems. All critical systems are backed up by dual Liebert uninterruptable power supplies (UPS). These UPS systems provide power during any outage long enough for our power generator to take over. Our main power generator is a 300kw Cummins turbo diesel power plant. This system outputs 480V 3-phase power directly to our Onan · Cummins transfer switch until primary power is restored. With a 700 gallon belly storage tank and additional fuel on-call we have enough fuel for autonomous power generation in the event of days of primary power loss. We use industry-standard BGPv4 to peer with multiple Tier 1 networks. This provides reliability through automatic failover and maintains connectivity even when one of our peers has internal problem with their routes. This allows allows our routers to choose from among our routes the best routes to any network anywhere in the world. If you want more details on our peers, some of our current bandwidth providers are listed at the bottom of the page. We exclusively use Cisco, the industry standard for dependable high performance routing and switching, at the core and distribution levels of our network. 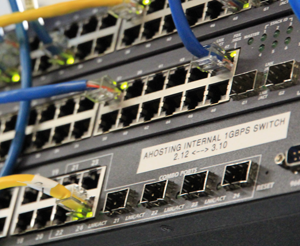 Access layers are handled by both Cisco and Dell switches. 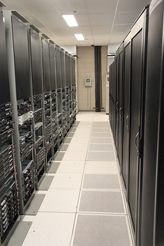 We've designed our data center for maximium cooling efficiency and redundancy. 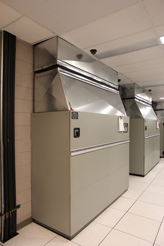 We use redundant 22-ton Liebert high volume air conditioning (HVAC) units. These units are setup in a downflow configuration to pressurize our raised floor cavity allowing our technicians to target cooling as needed. The Liebert system provides temperature, humidity and particle control creating an optimium environment for all of the hardware located in our facility. Our HVAC units are monitored 24/7 and physically checked by a staff member at the beginning of every shift. They are on a strict maintenance regime to keep them running at peak efficiency and capacity.